Pioneers in the industry, we offer heavy duty welder gloves from India. • Made of premium quality natural leather for heavy duty Welding and material handling purpose. • Special Strength to working parts due to double leather Patch at palm with premium grade stitching. 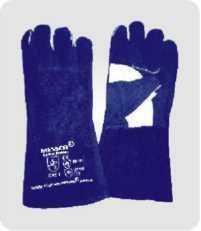 • Comfortable to work and sweat absorber lining inside Gloves. • Hemming at the end of cuff to avoid itching. • Long life in comparison to other gloves. Looking for HEAVYDUTY welder gloves ?